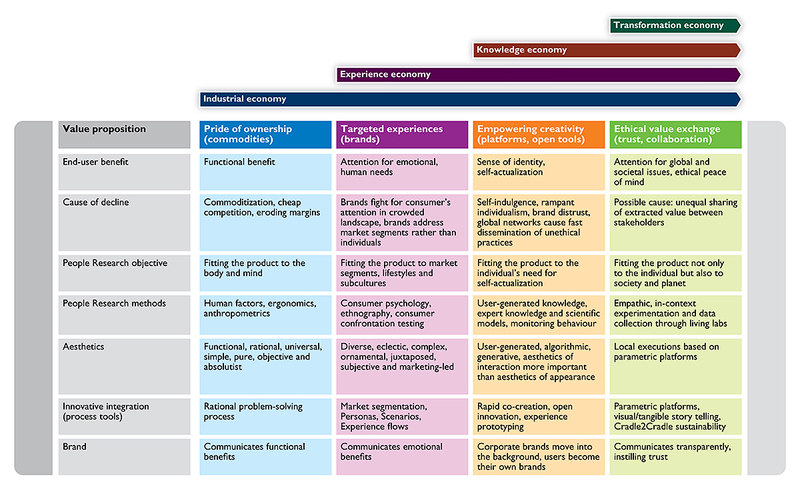 In this paper, we propose a design framework based on Brand & Rocchi’s (2011) four economic paradigms: the industrial, experience, knowledge and transformation economies. As design moves from one paradigm to another, its role changes with respect to the user, society, business and manufacturing. The industrial and experience economies are well-established, the knowledge economy is unfolding and the transformation economy is still in its infancy. Each of these paradigms calls for different design processes, methods and tools, as well as new breeds of designers with different competencies. We argue that if a company continues to use processes, methods, tools and competencies from an older paradigm, it can only come to solutions that fit that older paradigm. By contrast, adapting to a new paradigm will allow companies to extract more value from the marketplace. Companies that wish to enter Paradigms 3 and 4 will need to adopt new approaches to design innovation, for which we include recommendations. 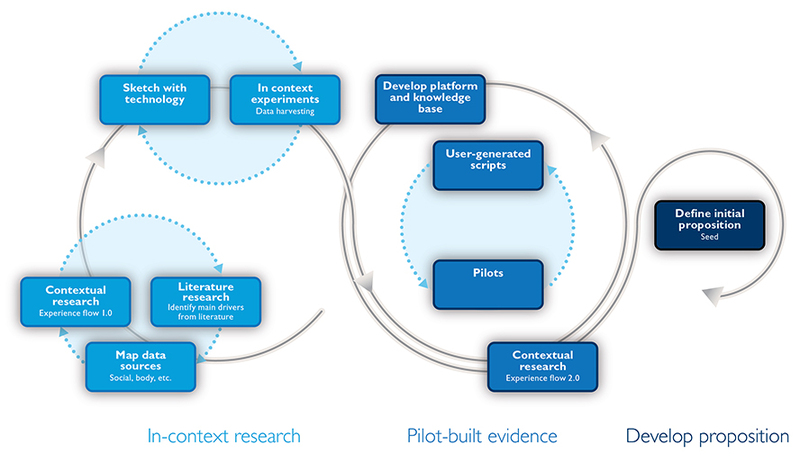 Developing this framework has helped us to chart implications for our own capability development; we publish it here because we believe that future innovation will require intensive collaboration between stakeholders, and so shared understanding of methodologies is crucial. We illustrate the framework with early signs in the area of durable consumer goods and with examples from other parties as well as our own. Keywords – Design history, Design Innovation, Design Methods, Design Process, Design Tools. Relevance to Design Practice – Creates awareness of how design practice needs to deliver innovation that is in tune with the contemporary socio-cultural and economic paradigm and the changes in competences, tools and processes this requires. Citation: Gardien, P., Djajadiningrat, T., Hummels, C., & Brombacher, A. (2014). Changing your hammer: The implications of paradigmatic innovation for design practice. International Journal of Design, 8(2), 119-139. Received October 2, 2012; Accepted November 10, 2013; Published August 31 2014. Copyright: © 2014 Gardien, Djajadiningrat, Hummels and Brombacher. Copyright for this article is retained by the authors, with first publication rights granted to the International Journal of Design. All journal content, except where otherwise noted, is licensed under a Creative Commons Attribution-NonCommercial-NoDerivs 2.5 License. By virtue of their appearance in this open-access journal, articles are free to use, with proper attribution, in educational and other non-commercial settings. Tom Djajadiningrat is creative director at Philips Design, The Netherlands where he heads the Future of UI project and is part of the Rapid Co-Creation team. He has a passion for polemics and experimentation at the cross-roads of society, culture, design and technology that go against common sense. His work revolves around co-created tangible concepts of relevant future possibilities that embody a position and influence decisions. He is particularly interested in storytelling, pattern recognition, simplification and tangible experimentation. Previous to Philips, Tom worked in design research academia as a member of the ID-Studiolab of TU Delft, the Designing Quality in Interaction Group of TU Eindhoven and the Mads Clausen Institute of the University of Southern Denmark. He holds a BSc(Hons) in Industrial Design from Brunel University, an MDes in Industrial Design Engineering from the Royal College of Art / Imperial College and a PhD in desktop virtual reality from TU Delft. Caroline Hummels is full professor at the department of Industrial Design (ID) at the Eindhoven University of Technology (TU/e) where she is heading the Designing Quality in Interaction group. Moreover, she is leading the interdepartmental theme Smart Environment, Health@TU/e. Caroline studied Industrial Design Engineering at TU Delft and also obtained her PhD there. Her current activities concentrate on developing theories, frameworks and tools to support designing towards personal, social and societal transformation. Her research, education and design activities address phenomenology-inspired design, research through design, aesthetic and embodied interaction, craftsmanship, engagement, wellbeing and multi-stakeholder design processes. She is a member of the steering committee of the Tangible Embedded, and Embodied Interaction (TEI) Conference, editorial board member of the International Journal of Design, and a member of a variety of (inter)national committees including the Provincial Council of Health. Next to her main job, she is co-owner of a small firm called ID-dock. Aarnout Brombacher was appointed 1-7-1993 as full professor at Eindhoven University of Technology. He currently is professor in Business Process Design in the faculty Industrial Design of Eindhoven University of Technology. With this chair he is responsible for research and education in the fields Quality Information Flows and Customer Perceived Quality in highly innovative product design and development processes. He has authored and co-authored over 100 journal papers and is, together with Doug Montgomery, chief-editor of the journal Quality and Reliability Engineering International. Since March 1, 2010 he is also Dean of the department Industrial Design and since March 1, 2012 also, next to this, Vice-Rector International Relations of Eindhoven University of Technology. In this paper, we describe a design framework based on four economic paradigms from a Western perspective (Figure 1). This framework was first proposed by Brand & Rocchi (2011) in a Philips Design document entitled Rethinking Value in a Changing Landscape. It describes how, as sociocultural forces change, people’s perception of what constitutes value changes, too. Figure 1 summarises these paradigms, and shows when each rises to prominence and becomes reflected in the Zeitgeist. Many companies continue to think in terms of a particular paradigm and to cling to their approach, while society has already moved towards a new era. Once a company has settled into a particular mindset and its ways of working have become routine, changing behaviour becomes difficult. Though the very word paradigm may suggest that the four paradigms are discrete categories that replace each other at the end of sharply defined eras, the reality, in fact, is a great deal more blurred. Paradigms typically emerge earlier in some industries than in others, causing multiple paradigms to coexist. A look at the Fortune’s Global 500, for example, shows that oil, financial and building corporations—which had already been joined by strong Paradigm 2 brands such as Pepsi-Cola, Apple, and BMW—now also have to share the list with Paradigm 3 companies, such as Google, Amazon, Facebook, and eBay. For those industries that lag behind, it is not always obvious how they should adapt to enter a new paradigm. We will argue that true innovation requires companies to keep up with paradigm changes and to build an intimate understanding of the paradigm likely to dominate at the time of product release. Delivering products and services attuned to contemporary sociocultural forces allows companies to extract much more value from the marketplace than a conservative approach innovating within an outdated paradigm. Our paradigmatic view of the future is strongly influenced by Kuhn’s contention that scientific progress is not a gradual “development-by-accumulation” (Kuhn, 1964). Kuhn argues for an episodic model in which periods of continuity are interrupted by periods of revolutionary development. According to Kuhn, it is not possible to understand one paradigm through the conceptual framework and terminology of a rival paradigm. It requires a fundamental shift in mindset and vocabulary, and this is what makes moving to a new paradigm so difficult. A paradigmatic view can also be applied to societies. Alvin Toffler (1980) describes three types of societies based on the concept of “waves,” with each wave pushing older societies and cultures aside. The First Wave is the Agricultural Age; the second is the Industrial Age society, based on mass production and mass consumption; the Third Wave is the post-industrial society, also called the Information Age. Toffler’s description of the last two waves has proven too broad to be of practical relevance to the design discipline. Brand & Rocchi (2011) split both waves into two (sub) paradigms in order to better define changes in society and user behaviour: they split the Industrial paradigm into the Industrial and the Experience paradigms (e.g., as described in Pine & Gilmore (1999)); and they split the Information Age into the Knowledge Economy and the Transformational Economy, as first described by Peter Drucker (1981), as well as by the UK Design Council. This paper builds upon Brand & Rocchi and aims to chart the consequences of each paradigm for design innovation, noting how each paradigm requires changes in design competence, tools, techniques and processes. Because the last two paradigms are unfolding or even just now envisioned, we provide recommendations to help companies and designers to make the shift towards these new paradigms. With the turn of the 20th century, societies in advanced industrial economies developed a shared aspiration to modernise their lives through the acquisition of products that fulfilled functional needs, automated many aspects of people’s lives and provided pride of ownership. This gave rise to the Industrial Economy after the Second World War (Brand & Rocchi, 2011). The Industrial Revolution resulted in many changes to society. The era around 1900 witnessed the massification of mechanised transport, including the railroad, the bicycle, the automobile and the aeroplane. Combined with the advent of mass production and electrification, these new systems made a host of new products affordable to the masses. By 1914, most of the electrical household products we use today were already available, allowing people to radically modernise their lives (Forty, 1986). Through such labour-saving devices, more and better-quality food, cleaner cities and better housing, modernisation contributed to a healthier society. These developments gave people a strong sense of progress. Technology and science were seen to hold great promise, and led to a Zeitgeist that glorified the ideas of rationality, Taylorian efficiency and functionality. The Modern Movement saw architects and craftsmen develop a “machine aesthetic” with buildings and products that expressed that they were, or at least could be, produced by machine. This visually pure, geometry-based aesthetic was seen as an expression of order and rationality (Sparke, 1986; De Rijk, 1998). The machine aesthetic reflected contemporary social democratic ideals, as it suggested that modernist products were suited to volume production and thereby available to the masses. It provided a clear departure from the intricate ornamental styles of the 19th century, which became equated with conservatism and elitism. Movements such as Bauhaus, De Stijl, Constructivism and Purism each advocated their own take on a universal and objective style. In keeping with the idea of the socialist welfare state, an intellectual elite of artists, architects and designers hoped to improve workers’ quality of life, as well as improve their tastes and raise their cultural aspirations (Overbeeke & Hummels, 2013). For example, one of Modernist architecture’s main ambitions was to replace the slums of the 19th century and to provide the proletariat with clean, spacious and light housing. In the industrial paradigm, there are two main modes of creating value. One is through increasingly efficient production aimed at cost reduction (e.g., faster production, less manual labour). The other is through continuous improvement—or at least perceived improvement—of products to sustain mass consumption. Mass-produced items required a type of design that was not well served by contemporary professionals. Artists and craftsmen, though skilled in various forms of 2D and 3D expression, focused on personal creativity and lacked knowledge of mass production. Mechanical engineers were clearly knowledgeable about technology and production processes, yet often lacked aesthetic sensibility. Architects were well-versed in visual expression and catering to clients, but were mainly used for the creation of one-offs rather than mass-produced items. What was needed was a person with a sensitivity for the visual language of mass production and its technical constraints, with business savvy and an understanding of user needs. It took until the 1950s, however, for design schools to deliver such generalist professionals, and many early industrial designers, such as those at the Bauhaus, were trained in an experimental mix of fine arts, crafts and architecture. The Industrial era saw the development of many traditional product-centred industrial design techniques, such as product sketching, technical drawing, presentation drawing and model making. Visual expression was systematically researched by pioneers such as Klee, with his experiments with point, line and plane, and Kandinsky, with his colour studies based on circles and squares (Manovich, 2007). Such a geometry-based aesthetic was considered universal and objective. If the user was considered at all, it was at best through an ergonomic lens. Anthropometrics reduced man to a normally distributed mechanical machine that a product needed to fit. To further the field of design as a rational discipline, evaluation and selection mechanisms were developed. Examples are the Weighted Objectives Method developed in postwar Germany (Pahl and Beitz, 1988) and the Harris Profile (Harris, 1961). Design quality had to be objectively measurable; intuition and subjective preference were considered suspect. A typical design process used in Paradigm 1 was the rational problem-solving process. This approach arose in different disciplines and was developed by the likes of mathematician George Pólya (1945), social scientist Herbert Simon (1969) and initiators of the Design Methods Movement, including Alexander, Archer, Jones and Rittel (e.g., Archer, 1965). This process can be described as “…the search for a solution through the vast maze of possibilities within the problem space... Successful problem solving involves searching the maze selectively and reducing it to manageable solutions” (Simon, 1969). Figure 2. Rational problem-solving design process. After the 1950s, Modernism started to fade out in the West (Kint, Ross, & Overbeeke, 2010). Rationalism, objectivity, universalism and the ideal of technology and science serving human needs made way for replaceability and consumerism. For consumers, branded products became a way to express their lifestyle and to associate themselves with particular social groups and subcultures. Until the 1960s, individual life choices and behaviours were largely dictated by the state, the Church and by pressure from local community and family. Historically, roles and occupations were often a given: if your father was a blacksmith, you, too, were to become a blacksmith. In the 1960s, as people became empowered by education, emancipation, affluence and mobility, they started to disengage from these existing structures and power relations. With communal control diminishing, many people gained the freedom to pursue more individual lifestyle options and to break the societal taboos of the 1950s. In an interplay between society and industry, companies started to offer branded experiences (Olins, 2008) that answered people’s need for self-expression and helped to shape their identities. By adopting combinations of brand choices, consumers could express their aspiration to belong to certain subcultures, paradoxically distinguishing themselves from others by assuming a new group identity. This phenomenon has been strikingly photographed by Versluis & Uyttenbroek (2002) in their photography project Exactitudes (n.d.). The hedonic pursuit of individual lifestyles put an end to the era of unifying ideologies. The cultural focus shifted from efficiency to luxury and comfort (De Rijk, 1998). Lifestyle segmentation created a plethora of visual styles, resulting in the demise of Modernism’s absolutist approach. By 1966, Venturi had published a manifesto arguing that cultural complexity and juxtaposition contributed to aesthetic richness and intellectual interest, in a direct repudiation of Modernism’s visual purity. The market and consumer psychology started to exert a bigger influence on design, as witnessed in the pop art movement and its embrace of commerce and reappropriated advertising. By the 1980s, the Modernist adage “less is more” was replaced by “less is a bore,” with postmodernist design collectives Studio Alchimia and Memphis advocating concepts such as diversity, eclecticism, ornament and colour to create a more enjoyable and fancier world (Horn, 1985). As competing products became increasingly similar from a functional and quality perspective, leading players were confronted with low-cost rivals who were driving down prices and eroding margins. Such commoditisation led companies to seek new ways to differentiate themselves, and creating strong, recognisable brands proved to be a way to do so. The word branding could not be more appropriate, as it derives from the practice of putting an identifying ownership mark on otherwise indistinguishable livestock by means of a branding iron. As part of a brand strategy, companies typically aimed to distinguish themselves on emotional grounds and to become more liked, admired or respected than the competition in order to be able to command higher prices (Pine & Gilmore, 1999). A key aspect of branding is market segmentation, in which tailored solutions deliver targeted experiences to customers who share particular lifestyles. According to Smith (1956), market segmentation involves viewing a heterogeneous market as a number of smaller homogeneous markets with differing preferences, allowing more precise satisfaction of consumers’ varying wants. Wind and Cardozo (1974) define a consumer segment as a group of present and potential customers with some common characteristics that are relevant in explaining and predicting their response to a supplier’s marketing stimuli. Although some companies in the Industrial Economy already used segmentation, it was manufacturing-oriented and focused on reduction of production costs rather than on the satisfaction of consumers. In Paradigm 2, companies began to apply market segmentation based on user experience as a starting point. Companies came to understand that the way consumers view a brand is not merely based on the use of its products and services. Rather, brand perception results from the sum of all points of contact between the user and brand, including advertising, packaging, point of sale and customer support. As a result, creative direction of brand strategy grew into a critical competence for corporate design teams and now required a holistic view of a variety of design disciplines, including product, interaction design, graphic and communication design. This shift created a need for a new breed of designer, one whose competencies could extend beyond object-centred thinking to shape the total user experience and a consistent brand identity over different touch points. Designers now needed to start thinking in terms of target groups with particular lifestyle preferences, and as a result design became more involved in the identification of consumer needs and desires. In translating these needs and desires into value propositions, designers needed to consider the stylistic and symbolic appropriateness of products for their target groups, leading to meaning-oriented approaches to design, such as semiotics (Bense, 1967) and product semantics (Gros, 1973; Krippendorff & Butter, 1984). The shift towards experience design led to new tools and techniques (cf. IDEO Method Cards, http://www.ideo.com/work/method-cards/) to help design teams understand users. These techniques include user observation in context, personas, scenarios, the “total touchpoint” approach and experience flows. User observation in context borrows from ethnography to identify patterns and rituals in people’s daily life. Personas and fictional users representing a particular market segment, in combination with “day-in-the-life-of” scenarios, help design teams identify product opportunities and end-user benefits. 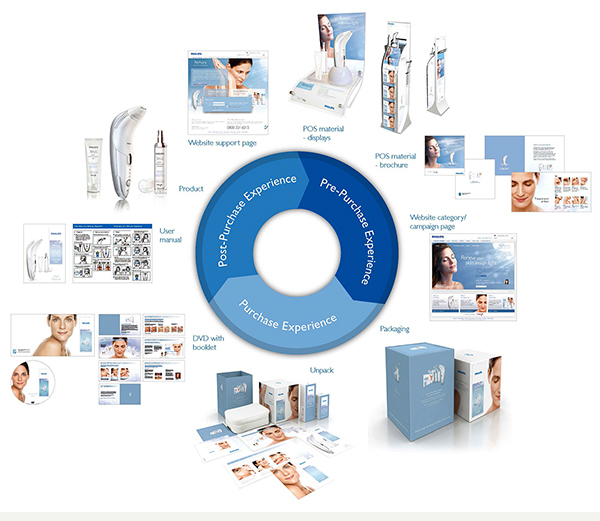 The total touchpoint approach (Figure 3) distinguishes between a pre-purchase, purchase and post-purchase experience, raising awareness of the various touchpoints between consumer and brand (Olins, 2008). On a more detailed level, design’s use of experience flows documents all user-product interactions during a product’s life cycle. In his social critique From Bauhaus to Our House (Wolfe, 1981) ridicules the rigidity of the Modernist design process and its disregard for human need. Wolfe argues that the modernist design process had become formulaic, and that its “one size fits none” approach showed little concern for the needs or desires of the end-user. A paternalistic Modernist designer elite was intent on deciding what constituted “good design” and prescribing to the masses how to furnish their lives. Paradigm 2 saw the arrival of several approaches that countered the objective, universal approach of Paradigm 1, and put human needs centre stage. We will discuss two of these approaches: reflective practice and user-centred design. In the 1980s, a renewed model for learning emerged called reflective practice, based upon works by Dewey (1933) and Piaget (1964). The term, first coined by Schön (1983), describes how in complex, real-life learning situations, theoretical frameworks and formalised knowledge do not suffice. Practitioners complement their theoretical knowledge by reflecting upon practical experiences, resulting in a wealth of non-formalised, practice-based knowledge. Schön identified two types of reflection: reflection-in-action and reflection-on-action. Reflection-in-action refers to the ability of practitioners to directly and intuitively respond to a challenge by drawing upon their intuition and prior experiences. Reflection-on-action refers to the ability of practitioners to reflect upon their experiences afterwards and to analyse their reasons for and the consequences of their actions. This distinction is useful because it underscores that the rigid design engineering process of Paradigm 1, with its intentional disregard of designer intuition, does not do justice to the design practitioner’s ability for reflection-in-action. Schön also introduced the notion of single loop vs. double loop learning. Single loop learning is when practitioners, even after an error has occurred and a correction needs to be made, continue to rely on current strategies and techniques. This results in design propositions at best reaching a local maximum. Double loop learning occurs when practitioners are open to changing strategy and are able to reframe the situation at hand. Modernism’s rigid reliance on formulaic manifestos and its unwillingness to change approach when challenged with user concerns may be seen as single loop learning. Schön captured these notions into the design process in Figure 4. Figure 4. Reflective practice design process. Schön’s thinking fits well into ethnographic user studies of target groups, which typically require designers to first observe without employing hypotheses or prior judgments. When design ethnographers make an intervention (e.g., change the situation by bringing in prototypes), this typically results in what Schön named “backtalk”: when designers make a proposal, the users and the environment “talk back.” It is the designers’ openness to reframing the situation and adjusting their mindset in response to this backtalk that is essential in identifying innovative product opportunities that fit user and context. In the move towards the knowledge economy, we see that the user and his experience become more and more important during the design process, reflected by a strong user-centred design movement. Processes like ISO Standard 13407 (Figure 5) show the sensitivity and willingness to drive the design process by user needs. Figure 5. ISO Standard 13407 design process. Before we move on to describe the knowledge and transformation paradigms, we offer an example from healthcare to contrast the industrial and the experience paradigms’ effect on design. In CT scanning, patient anxiety is an issue not only from an experience point of view, but also from an efficiency and a clinical perspective. When non-compliant patients need calming down, patient throughput decreases. Pharmacological intervention (i.e., sedation) is not an optimal solution, as it results in extra recovery time, prevents patients from driving home and may lead to undesirable interaction effects with other drugs. From a clinical point of view, anxiety may compromise image quality when restless patients do not lie still. The ability to compensate for patient movement has increased with technological advancements in the resolution and speed of the scanner. Addressing the problem of anxiety-induced patient movement through improvements in technical performance may be considered a Paradigm 1 approach. In early 2000, Philips Design started to explore another route to reduce patient anxiety. By redesigning the total experience of a patient undergoing CT treatment, not only the patient’s wellbeing but also the efficiency of the workflow and the clinical outcome could be improved. Philips uses the term Ambient Experience to describe the use of coloured light, projected images and sound (Figure 6). Research by the Netherlands Cancer Institute confirms that such an approach indeed reduces patient anxiety (Vogel et al. 2012). Figure 6. Ambient Experience suite with MRI scanner. 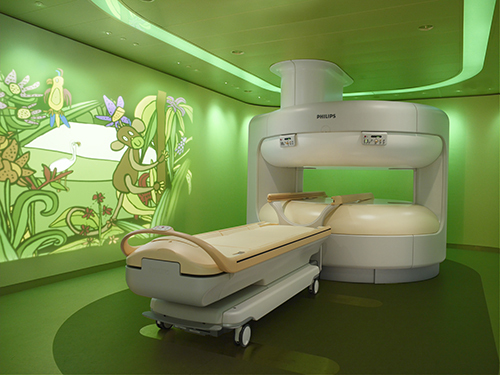 Building on this approach, in 2004 Philips Design set out to improve the paediatric CT scanning experience, involving the Advocate Lutheran General Children’s Hospital in a co-creation process. For children, an examination room filled with equipment and a massive scanner is even more frightening than for adults. The task of the CT technician is to ensure that as many children as possible successfully complete the examination. Children need to lie still and hold their breath during the procedure to ensure optimum image quality. For many sick children this is difficult, as they are likely to be upset and possibly in pain. Applying the concept of human-focused healthcare and a research-driven innovation approach, Philips Design proposed a new CT system design to support children, their parents and the CT technician during the full process from preparation to completion of the exam. Research with paediatric specialists resulted in two insights to improve the child’s experience: First, narrative engages children in experiences and creates a natural storytelling role for parents; second, a child is more likely to be compliant if it is provided with a simple explanation and understands what will happen and why. These two insights resulted in The Kitten Scanner, a toy CT machine (Figure 7). 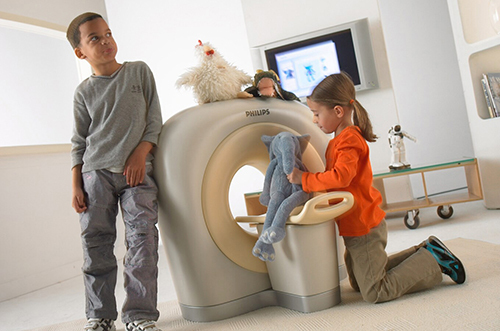 By choosing a toy and placing it into the scanner, a child triggers an animated story that helps them to understand the procedure in an entertaining way. They can see that if the toy is shaken in the scanner the image distorts, so they know they must lie still to get a good image. The type of toy that a child chooses affects the personalisation of the examination room through animated projections and lighting. The technician can use these effects to guide a child through the procedure. Figure 7. The Kitten Scanner. Ambient Experience (AE) can be thought of as a Paradigm 2 approach to innovation in CT treatment. AE improves system performance, including a decrease in procedure duration and a higher percentage of successful scans, not through a focus on the technological performance but through taking a user experience point of view (Verganti, 2011). This focus on user experience affects not only the patient but also other users—hospitals that use Ambient Experience suites report an increase in satisfaction amongst medical staff. Finally, from a branding point of view Ambient Experience results in a highly recognisable, iconic experience. In Paradigm 3, the experience economy suffers as it becomes increasingly difficult for brands to attract people’s attention and differentiate themselves in a crowded landscape. With the advent of the Web 2.0, online communities become places for people to reaffirm their identity through creative expression, causing brands and subcultures to become less dominant in shaping people’s lifestyles. Online communities also offer a sense of belonging, as they allow like-minded people to share knowledge and skills. Companies can now create value through an open innovation process that builds upon this user-contributed knowledge, complemented with knowledge from experts and knowledge about user behaviour. In the knowledge economy, individuals can shape their own lives. Rather than staying within the boundaries imposed by subcultures, they can pick and mix relational, educational and consumption options to lead a life uniquely their own. It is no longer surprising to hear of a snowboarding father of two or a farmer studying philosophy. Though the freedom to shape one’s own life is usually seen as a gain, the obligation to make choices can, surprisingly, also be seen as a burden: one no longer has the freedom not to choose. As a result, some people look for ways to prevent themselves from getting lost in the diversity of their own choices. By documenting their lives—including their needs, desires, values and opinions—in blogs and on social communities, these individuals can reflect upon their life stories and reinforce and reaffirm their sense of identity: This is who I am. Psychologists refer to this key aspiration as self-actualisation. In contrast to the experience economy, in which a lifestyle was a “uniform” adopted by a group of people, in the knowledge economy a lifestyle becomes a truly personal mix of activities and behaviours. Ubiquitous wireless networking and the explosive growth of Web 2.0 sites accelerate the possibilities to creatively express a uniquely personal lifestyle. Web 2.0 sites, such as media-sharing sites, metaverses or online social communities, allow people to socialise and share their lives, be it through photos on Flickr, updates on Facebook or movie reviews on IMDB. As a result, an increasing number of users are not merely passive consumers of professionally created content, but instead are involved in creating and publishing content themselves. The catchphrase “the rise of the amateur professional” has emerged to refer to user-generated content that can match or even exceed the quality of professional content. Facebook alone has more than 600 million daily active users, a figure double the adult population of the U.S.; Google+ has 359 million active users; Twitter is close to 300 million users (Tam (2013), Watkins (2013)). While the majority of Web 2.0 users may not create content—for example, of the 359 million active Google Plus members, only 135 million posted content—even “lurkers” who limit themselves to simply clicking likes or dislikes are considered indispensable to collaborative rating and filtering systems, which help online communities to identify quality content. Rating and discussing each other’s content also allows users to create new social cohesion in their online communities. While a sense of belonging was provided by the Church and local community in Paradigm 1 and by subcultures in Paradigm 2, in Paradigm 3 this role is increasingly taken over by online social communities. These days, it is not uncommon to feel greater connection to people one has never physically met than to physically-present neighbours and colleagues. While Paradigm 1 focused on the creation of commodities and Paradigm 2 on branded experiences, Paradigm 3 centres on knowledge: Paradigm 3 companies increasingly create value through an open innovation process that leverages user knowledge, expert knowledge and knowledge about use. For companies, hosting quality user-generated content creates value because it draws in network traffic that generates advertising revenue. The data that companies collect about their online audience can be sold to others to tailor advertising. Another value creation aspect of Web 2.0 is that existing users effectively become extra staff members who attract and support new users, allowing Web 2.0 sites to scale very quickly. Many of today’s design challenges are too difficult to solve through traditional designer competences. For example, as Philips repositions itself as a health and well-being company, many projects now include how to support people in leading healthier lifestyles in regards to sleep, relaxation, nutrition and physical fitness. This requires end-user behavioural changes that are far more profound than adopting a different brand of soft drink or smartphone. Stimulating such behavioural change cannot be achieved through the marketing-led approach of the experience paradigm. Instead, addressing such behavioural issues requires expert knowledge in diverse fields such as communication science, behavioural psychology and physiology. Such in-depth knowledge is difficult to acquire through desk research, as it has not yet been unambiguously formulated for use by lay people Additionally, each of these scientific fields has ongoing debates—often in specialized language—that can require years to understand. Therefore, companies need to foster ongoing relationships with experts through knowledge networks (Verganti, 2009) to help companies identify relevant information. These experts may come from academia, government, non-profit organisations and societal bodies as well as from industrial partners. The impact of novel products and systems on people’s lives is difficult to foresee. Both users and products are adaptive, and new behaviours take time to emerge, requiring changes in design’s people research methods. Single confrontations can be misleading, as participants may initially respond too positively to a new proposition because they are overwhelmed by its wow effect, or too negatively because they are unaccustomed to it. Long-term ethnographic observation may be too intrusive in certain domains, such as sleeping habits or bathing rituals. Companies, therefore, need new ways of gaining insight into existing user behaviour, as well as new behaviours that emerge in response to intelligent products. One increasingly popular approach is for companies to closely collaborate with users over longer periods of time through constructions such as open design, co-creation and participatory design (Boer & Donovan, 2012). A second emerging approach is to collect data in the field through sensor-equipped prototypes: as users live with prototypes over extended periods of time, many quick iterations can be built driven by data and user feedback. A third approach can be seen in the software world, where it is now common practice for new products to remain in seemingly permanent beta. Google Labs, for example, releases many early initiatives to test the water and to see which ideas gain traction. In the knowledge economy, designers need to be able to orchestrate open innovation processes to leverage the aforementioned knowledge of both users and experts. They also need the ability to rapidly explore, analyse, define and build interactive products and systems—in particular their behavioural elements—in order to evaluate potential solutions with users. Consulting and working with outside experts has always been a necessary skill for designers. In Paradigm 1, these experts came from adjacent disciplines: toolmakers, mechanical engineers or visual trend analysts. In Paradigm 3, however, designers need to listen to experts from “foreign” disciplines, such as behavioural psychologists and sociologists. Orchestrating open innovation must also extend to users. While user involvement formed part of the experience paradigm, designers approached users from a third-person perspective through, for example, observation and interviews. In Paradigm 3, however, designers need to be able to take a first-person perspective: they need to intensively collaborate with potential users—functioning not only as objective observers conducting user studies or as mere facilitators of co-design sessions, but also as subjective participants in which they themselves are part of the solution space (Hummels, 2011). Open design and innovation implies that the boundary between designers and users is blurring. In terms of the organisation classification of Hummels (1996, after De Geus, 1989), Open Design is moving towards a libertarian relationship between designers and users. This libertarian relationship differs from a rational one, in which the designer is seen as superior. It also differs from an integrating relationship, in which the designer safeguards the interests of the majority of potential users. The libertarian approach emphasises the freedom and personal responsibility of every individual to exercise their knowledge, skills and ethics. This means that designers are no longer placed above users when determining what is right for them, but that designers are part of a larger community (Hummels, 2000). Even earlier, Rittel and Webber (1973) had proposed to reconsider the traditional division between experts and stakeholders. In their discussion of wicked problems—in which not only the solution but also the problem itself has not been agreed upon—they use the term “symmetry of ignorance” to denote that all stakeholders are equally expert or equally ignorant. Exploring interactive products and systems through quick iterative loops of prototyping and testing with users—a process that within Philips is called rapid co-creation—is becoming increasingly important. Rittel and Webber (1973) posited that the only way to tackle a wicked problem is to devise solutions and see how they further understanding of the problem. In the design of interactive products and systems, the traditional design skills of Paradigm 1 fall short, as these are focused only on physical aspects of products and so fail to address the temporal and expressive aspects of interactive behaviour (Frens, Djajadiningrat, & Overbeeke, 2003; Kyffin, Feijs, & Djajadiningrat, 2005). In Paradigm 3, designers need to move beyond simple causality to understand interaction aesthetics, to be able to design expressive interaction behaviors and to capture such behaviour in experience prototypes. Here, experience prototypes do not focus on evaluating technology but on the resulting experience for the end-user. Though one would expect computer scientists and electrical engineers to excel in building such interactive prototypes, they are often uncomfortable with poorly defined problems and the notion of quick-and-dirty, as they are accustomed to working to exact functional specifications and creating deliverables to the highest technical standards. Paradigm 3 designers, therefore, need to be able to take the lead and to work from a vague initial brief to build prototypes using “whatever it takes” to explore the user experience. Paradigm 3 designers may also benefit from new approaches in software development, such as agile and extreme programming that focus on early and continuous delivery of working software, that welcome changing requirements and have customer satisfaction as the highest priority. In Paradigm 3, the designer’s toolbox needs to support the rapid development of interactive prototypes to explore product behaviour. This toolbox is already growing. Techniques such as body storming, Wizard of Oz and the use of props (Burns, Dishman, Verplank, & Lassiter, 1994) can give designers a feel for the envisioned behaviour before committing to building experience prototypes. Rapid prototyping tools, such as 3D printers and laser cutters, can accelerate the physical expression of ideas. Rapid application development tools help to speed up software programming. Electronic prototyping toolkits help to fast-track the integration of microcontrollers, sensors and actuators into physical prototypes (Figure 8, Knoester, Ross, & Djajadiningrat, 2012). “Sketching” is a term that is often used to describe a fast, low-cost approach to exploring interactivity (Buxton, 2007; Kyffin et al., 2005). 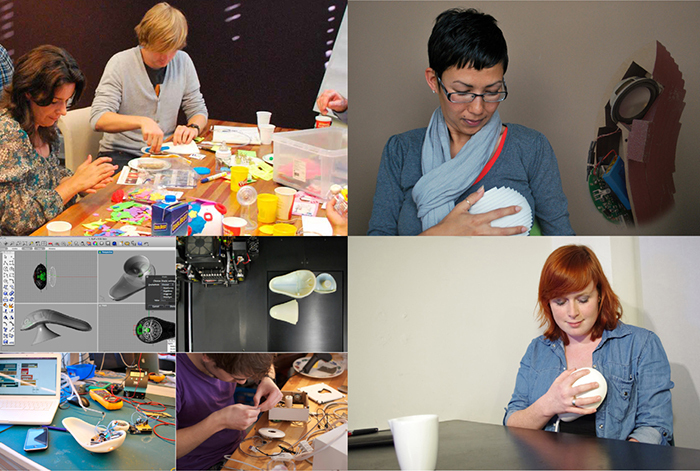 Co-creation workshop with potential end users (top left); a low-fidelity model built from layers of lasercut multiplex (top right); different tools including 3D modelling (Rhino), 3D printing, a microcontroller (Arduino) and a RAD software environment (MAX/MSP) (bottom left); and the final high fidelity model (bottom right). Sensor-equipped prototypes allow for the monitoring and logging of user behaviour and product use over longer periods of time without observers being present. These prototypes shift people research from a number of discrete encounters in the field to a continuous process in which participants live with experience prototypes. Longer periods of product use increase the design team’s chances of identifying new behaviours that emerge over time. This form of data collection also allows designers to gain insight into activities and contexts where an observer might be an undesirable presence. Data-supported people research produces dense data that requires analysis and interpretation. Data-driven visualisation, made possible through real-time computer graphics in combination with visually-oriented programming languages, allows for a designerly way of recognising patterns within complex, multidimensional data. Data visualisation is useful not only in helping design teams understand data from user studies, but also in UI design, where it may help users to gain insight into their own behaviour. Algorithmic thinking and the creative writing of code to enable the insightful and aesthetic visualisation of data thus become key designer techniques in Paradigm 3 (Maeda, 2001; Fry, 2008). An algorithmic approach to design is, however, not limited to graphics and animation. By using scripted computer modelling programmes and rapid manufacturing techniques, design teams can create 3D forms that cannot be realised through conventional approaches to 3D CAD and manufacturing. In the architectural community, a new “generative design” movement has sprung up, providing an algorithmic approach to creating surfaces and spaces (Littlefield, 2008). Though industrial design has come late to the generative design table, algorithms are now leading to new aesthetics and functionality in products. The insights of Schön and the focus on the user are incorporated and further developed in the knowledge paradigm. As companies strive to create value through open innovation processes, two design approaches have emerged. The first design approach is initiated by users-as-producers, in which users take the lead in designing, customising and/or building their own products with the help of production facilities such as FabLabs. This movement is reflected in approaches and communities such as Open Design (Van Abel, Evers, Klaassen, & Troxler, 2011), Do It Yourself platforms and MakerBots. Since this approach is less formal and not institutionalised, there is no distinct design process used apart from a highly exploratory, hands-on approach. The second approach connects industry closely to active users and their everyday life by making use of lead users (Von Hippel, 1986) and grass-root innovations. Traditional contextual (ethnographic) research into user activities, complemented with a process of “sketching with technology.” Informed by scientific literature, these rough hacks aim at harvesting data in contextual experiments, leading to an enhanced view of human experience. Pilot studies that target specific parts of the challenge and that enable users and third parties to tailor the platform to their needs through “user-generated scripts.” The platform developer may gain new insights from these user experiments to further develop the platform and knowledge base. Here we give a number of examples of companies and products that use aspects of Paradigm 3. Shapeways is an online additive manufacturing portal (www.shapeways.com) that grew out of an idea by Philips Design and subsequently developed within a Philips incubator. Shapeways is a Paradigm 3 company offering in that it provides a platform that empowers its customers to form a community of creative entrepreneurs in the area of durable consumer goods. With Shapeways, digital 3D creatives can not only have their 3D files printed, but also sell these designs through the Shapeways webshop. Shapeways also empowers users to coach each other by sharing knowledge through online forums, thereby partially offloading customer support to the Shapeways community. Zoybar is an open R&D Lab where academics, hobbyists and commercial developers join forces to create musical instruments and applications (Ilan, 2011). Zoybar’s open R&D model provides an online platform and access to production files to enable further customisation and development by community members. A recent example of a Zoybar product is the rapid prototyped TOR guitar (Figure 10). (Photo credit: Bård S.D on http://www.zoybar.net). The Máxima Medical Centre and TU/e Eindhoven are working on a research project called Neonatal Intensive Care Unit (NICU), with an emphasis on the bonding between parents and premature babies. As a result of advances in the past decades, neonates born after 25 weeks of pregnancy can now survive in a NICU. Such premature babies can weigh as little as 500 grams, be the size of a palm, and are very vulnerable to external disturbances (Chen, 2012). Painful procedures (e.g., patches, venepuncturing), loud noise and bright light make a NICU a highly stressful environment for a premature. These issues, in combination with diminished contact between premature and mother, lead to impaired bonding, which can lead to behavioural disorders in later stages of development. Follow-up studies found that 50% of premature babies show deficits in their further development, including poor visual-motor integration as well as behavioural, attention and learning problems. An example of an intervention that is medically sound, yet also improves the quality of life of baby and parent through improved bonding, is skin-to-skin contact, also known as kangaroo care. The project’s deliverable is a smart jacket, proposed by Bouwstra, Chen, Feijs, and Oetomo (2009), which significantly saves time, allows for non-invasive measurement of many vital signs and does not damage the newborn’s sensitive skin (Figure 11). The shift from a rational approach focused on the survival of the child to a broader approach that takes into account the experience and well-being of premature parents can be viewed as typical for Paradigm 2, the experience paradigm. Figure 11. Smart jacket for premature babies, allowing kangaroo care and non-invasive measurements. However, the traditional Paradigm 2 methods (user experience) were not sufficient to produce a successful solution. The design needed to be grounded in a solid understanding of mother-child bonding (Bouwstra, Chen, Feijs, & Bambang Oetomo 2012), which could not be learned from ethnographic field studies. Data about the baby’s experience needed to come from measurements. In this case, designers had to adopt a Paradigm 3 approach and to network with scientific experts to learn about the latest psychological insights into bonding, and about collecting and interpreting physiological data (Piqueras, 2012). To do this, the design team established an extensive knowledge network with the TU/e Signal Processing Systems group of Electrical Engineering, VU Amsterdam’s Faculty of Psychology and Education, the VOC (a Dutch society for parents of premature babies), the MMC’s clinical Physics department, and TMSI, a company specialised in electrophysiological measurements. There is growing public discomfort with the downsides of the first three paradigms, which include pollution, global warming, wealth disparity and poor overseas labour conditions. We see early signs of this in consumer markets, as shoppers are starting to appreciate products that are ethically and sustainably produced and traded. Until recently, sustainability was passed off as expensive and naïve. Today, companies such as Interface Floor (Anderson & White, 2011) are now finding new approaches in which sustainability makes superior business sense. However, sustainable solutions to big issues such as poverty, food, energy and pollution cannot be created by a single player—not by a single company, not by government, not through a grass roots movement. To solve these issues, industry, government, academia and local user communities will need to collaborate to create local solutions that contribute to the larger whole. In Paradigm 4, the transformation economy, design will need to be concerned with the understanding of societal value (e.g., the Grameen Bank for the poor) and the ethically responsible extraction of market value. In this paradigm, the term “value extraction” feels misplaced, as value is created based on reciprocity: each partner extracts value, and it is not necessarily the industrial partner who gains the most. The mutual trust required in such public-private value networks can be considered a source of economic value. There is increasing public awareness that behind the shiny façades of leading brands hide ethically dubious practices. While these Paradigm 2 companies create value through quality experiences, they often retain a Paradigm 1-style, cost-down approach for elements that remain out of sight of the consumer. In the recent past, some of the most respected brands have become tainted by their association with poor working conditions in cheap-labour countries, child labour, pollution, deforestation and cruelty to animals. Companies have also been slow to accept responsibility for the societal consequences of their products, including obesity from addictive fast foods, safety inequality caused by lifestyle SUVs or gadget waste streams ending up in developing countries. Individuals are increasingly discovering that branded experiences go hand-in-hand with rampant individualism, globalisation, consumerism and built-in obsolescence (Barber, 2007; Klein, 1999). Because social networks span the globe, it has become more difficult to keep such ethically dubious practices from view and, once out in the open, public outrage travels fast. While Paradigm 3 companies may be less involved in the negative consequences of industrial production, they do carry responsibility for the data they harvest. Often it is not transparent to consumers what happens to the data they share on seemingly free search engines and social networks. Non-transparent data-mining—whether for commercial purposes or for matters of (inter)national security—has led to increasing public concern about the privacy of personal data. A similar responsibility-oriented discussion questions the capability of an unfettered free market to deliver socially fair and meaningful solutions. The economic crisis and accompanying bailouts of multinational corporations and banks by governments with taxpayer money caused free market capitalism to lose some of the invincible shine it gained after the fall of the Soviet Union, and further amplified doubts about the individualistic pursuit of prosperity at the cost of society. This Zeitgeist was expressed clearly by Occupy, the protest movement drawing attention to corporate influence on democracy, to growing disparity in wealth, and to the absence of legal repercussions for those responsible for the global financial crisis (Chomsky, 2012). A third related issue with the knowledge economy is that its online social communities have focused more on the pursuit of personal ambitions than acting truly social in spirit. The challenge to all companies operating in Paradigm 4 is that sustainability and well-being require behavioural change not only at an individual level but also at a societal level, and that collective interests need to be balanced with those of the individual. To succeed, the transformation economy will likely need to replace globalisation with a systemic approach to local solutions, each of which can contribute to solving large-scale global issues. Local solutions to big collective issues cannot be created without intimate, empathic knowledge of the local context, needs and culture, nor can they be created by a single stakeholder. To arrive at meaningful solutions, a wide variety of partners—including industry, academia, government, NGOs and local user communities—need to join forces in public-private partnerships (Den Ouden, 2012). Truly sustainable solutions cannot be realised through incremental changes, but will require a radical approach. This requires that all involved partners change their ways of working dramatically. This is a challenge for all stakeholders, since most of them are still operating in the industrial or the experience economies, and so will need to take an enormous step forward to enter the transformation economy. In the meantime, the clock is ticking on many of the big issues, such as healthcare and economic stability. Solutions requiring behavioural change are more likely to be adopted when they have the buy-in of the local community than when they have been imposed top-down. By nurturing continued relationships with local partners, companies increase their chances of success and become respected players in these value networks. CityMart and “Slimmer Leven 2020: Innovation Network for Active and Healthy Ageing” are examples of such networks and ones in which our institutes participate (CityMart, n.d.; Slimmer Leven 2020, n.d.). Such value networks, in which all partners go through a transformation process and come to trust each other, are difficult for competitors to displace. Trusted relationships are not Paradigm 1-style commodities—they cannot be copied overnight and offered more cheaply. Though local execution demands local attention, multinationals catering to different regions will need to look for knowledge that holds across multiple local solutions. By working on related problems in different locations, companies can build an overarching understanding of these local problems. Based on this knowledge, it becomes possible to create design templates that offer a parametric approach. Rather than imposing a single global solution on different contexts or offering tailored solutions that suffer from a limited understanding of local needs, companies need to create platforms that local designers can shape to fit their needs. The transformation economy requires designers—in collaboration with other partners—to envision and explore a “new” society. The competences mentioned under Paradigm 3 are not sufficient here, since in the transformation economy the focus is on meaningful living, empathy and cooperation rather than on self-actualisation and the pursuit of personal aspirations. In Paradigm 4, all stakeholders will be required to take a first-person perspective and to be personally dedicated to making the societal transformation a reality for society, including themselves. Designers have an important role to play in this process, as they are already used to empathising with end-users and so further along in their progression towards a first-person perspective. Because Paradigm 4 solutions are so radically different from existing ones, the transformation economy especially benefits from clear communication during the development process. Concretising ideas by making the transition from words and diagrams to storyboards and models helps all partners to discuss and rank ideas. Storytelling supported by visuals and tangibles can be especially helpful in smoothing the cooperation between stakeholders. Compelling stories cut through complexity, emphasise key ideas and bring lucidity to the thinking of all involved. Paradigm 4 requires a new take on people research. Homelabs—staged user environments—offer much experimental control, but lack the richness and rituals of users’ authentic environments and therefore lack ecological validity. An alternative is a living lab, which involves users as co-creators and enables experimentation in real-world settings (Almirall & Wareham, 2008). Van Gent et al. 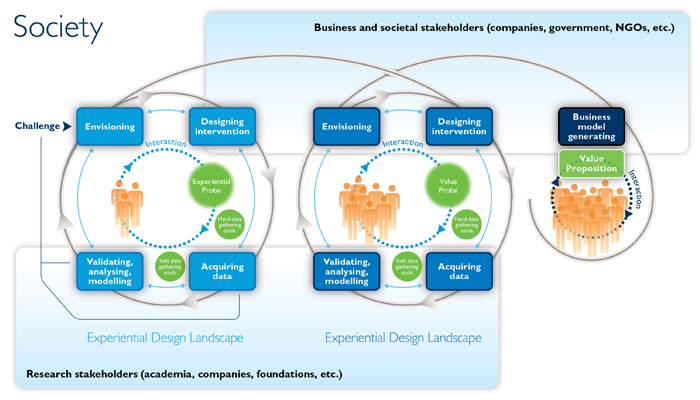 (2011) propose a related design research method, called Experiential Design Landscapes (EDLs) (Figure 12), aimed at the design of intelligent systems, products and services. This design-driven method supports the development and probing of radically innovative concepts to support behavioural change and societal transformation by studying people in their natural environment. EDLs utilise smart sensors, data mining and behaviour recognition algorithms to allow analysis of the new behavioural and usage patterns that may emerge during a given interaction. The EDL method discerns three phases that move from exploration—led by design research—to valorisation, led by industry (Peeters, Megens, IJsselsteijn, Hummels, & Brombacher, 2013). Cradle to cradle (C2C) is a design methodology aimed at creating sustainable products, services and systems (Braungart & McDonough, 2002). It models human industry on nature’s processes, in which materials are viewed as nutrients circulating in healthy, safe metabolisms and in which waste equals food. C2C identifies two different cycles of nutrients: one for biological nutrients and one for technical nutrients, which must be kept strictly separate. The biological cycle can interface with natural ecosystems without causing harm. The technical cycle allows materials to return to the manufacturer with little loss and in uncontaminated form. A discerning quality of the C2C process is that it is essentially waste-free. As natural resources become more rare and more expensive, such a waste-free production process becomes increasingly interesting from an economic value perspective. Cradle to cradle may involve rapid manufacturing on location. As oil prices rise, it is only a matter of time before rapid manufacturing becomes competitive with hauling mass-produced items across the globe. Rather than providing technical and aesthetic guidelines, a company could provide computer-based tools that embody its technical expertise and identity. When local designers deploy such a tool, the result will automatically meet the company’s technical standards, as well as be recognisable as its offspring. This builds trust: even though the resulting products are neither designed nor built by the company, they still embody its qualities because they were designed using its tools. To a certain extent, software development already works in this way. When software developers employ a professional software development environment they can expect the resulting programmes to meet certain quality standards. Often, the results can also be recognised as having been built on a particular platform. Bruce Sterling (2005) introduced the neologism “spime” to describe futuristic products that exist both as a digital specification and as a physical implementation. By equipping products with sensors, these products can be tracked through space and time and log their use. When this data is fed back to the design team, the digital specification can be updated to reflect the real-life use to which the physical implementations have been exposed. In combination with rapid manufacturing, this can result in quicker, small-series production iterations with an increasingly better fit to actual use. A present day example is a Formula One racing car. Most aspects of the car, including aerodynamics, suspension and engine management, exist as a digital, computer-modelled specification. For every race, the physical car is built according to this specification. As the physical car is equipped with sensors, every training and race results in data that can be used to update and tweak the computer model. Though we do not yet have a formal method for the design process in Paradigm 4, for guidance we propose the Reflective Transformative Design (RTD) approach. 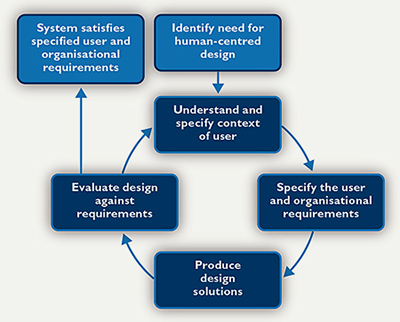 This approach supports the design of dynamic systems, products and services by emphasising values such as openness, context and person dependency, and development through reflection (Hummels & Frens, 2011). In this approach, developing design solutions is seen as a process of making conditional decisions based on too little information (centre of the model, Figure 13). Insight into design opportunities and the solution domain is achieved by continuous information gathering, for which there are two drivers. The first driver is information gathering to help a multi-stakeholder design team build a vision (top circle). 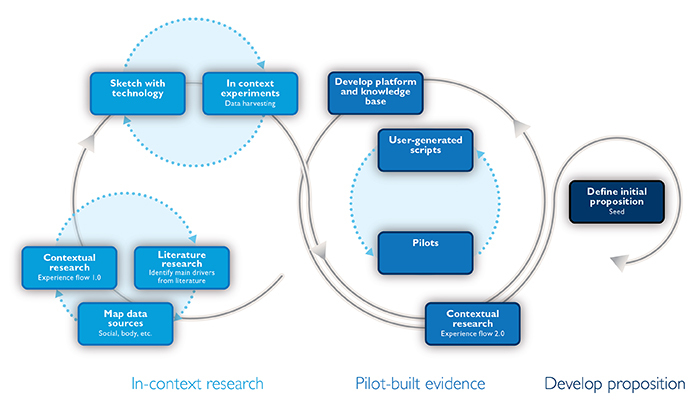 The second driver is information gathering to explore and validate design decisions in a real-life context with users, even beyond market launch (bottom circle). These drivers inform two strategies that generate information and provide focus. The first strategy revolves around design action, both synthesising and concretising (left circle). 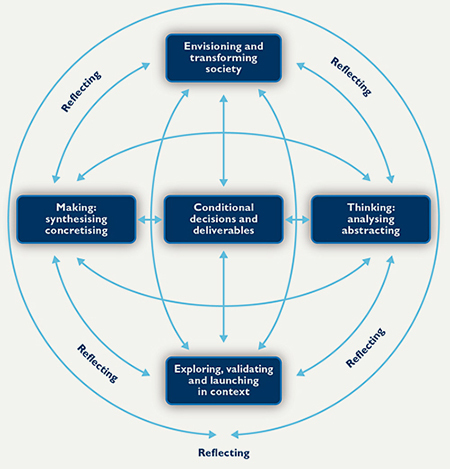 The second strategy revolves around academic thinking, analysing and abstraction (right circle). Depending on the person, context, or phase within the design process, the multi-stakeholder design team determines where to start and the order of the activities. The multi-stakeholder design team needs to determine how often it switches from one activity/circle to another, although a rapid pace is recommended during the early phases of the design process, but also during the later phases, since this enables the design team to get a grip on the interaction of diverse social contexts and markets. Figure 13. The Reflective Transformative Design (RTD) process. 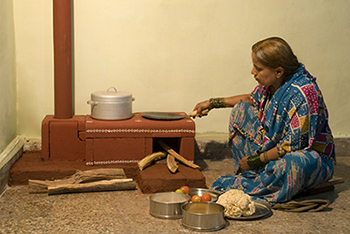 Jointly developed by local designers, Western designers, local NGOs and users in India, the Chulha stove (Figure 14) aims to reduce disease from smoke inhalation caused by indoor cooking with biomass fuel (Rocchi & Kulkarni, 2010; Rocchi & Kusume, 2008). The stove’s design is based on insights gathered from and tested by users. Its modular design allows the chimney to be assembled from several sections, simplifying manufacture and transport. The Chulha is locally produced and distributed, relatively inexpensive and easily made. This effort exemplifies Paradigm 4 behavior by combining creative skills with local insights to deliver solutions that value differences in culture and contexts of use. Customisation is encouraged through the free distribution of design specifications. Figure 14. The Chulha stove. As discussed earlier in this paper, Philips’ Shapeways webshop includes parameterised designs that can be customised by others. One example of such a design is the Light Poem, a candleholder formed by a decorative spiral of text (Figure 15). On the website, users can type in a text string and, at the press of a button, the 3D preview window will show the candleholder with this text, ready for 3D printing (Light Poem Creator, n.d.). 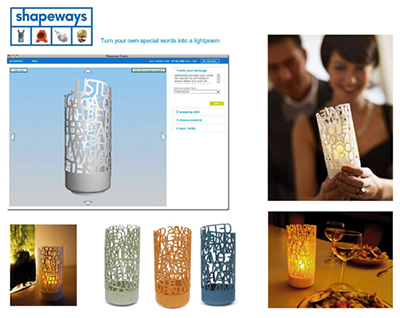 Shapeways enables designers or lead users to develop 3D templates that consumers can modify to their needs and liking. Though basic, the Light Poem is an example of how design may move from a Paradigm 2-style focus on fully finished, iconic products to a Paradigm 4-style platform that others can adapt to their local needs. Figure 15. Shapeways Light Poem. Many companies adopt technologies belonging to a newer paradigm, yet keep the mindset from an older paradigm. While this may help improve performance according to the metrics of the old paradigm, it typically fails to extract more value from the marketplace. For example, most companies have by now embraced the internet to provide downloadable product documentation. Many, however, have not enabled their user communities to share experiences and support each other. These companies are still working according to Paradigms 1 and 2, mixing product-centred and touchpoint thinking rather than leveraging the wisdom of the crowd according to Paradigm 3. Similarly, many companies actively seek to lessen the environmental impact, redesigning their products to use less energy or to be less polluting. Yet such an optimisation towards “less bad” is in essence still a Paradigm 1 approach. If this optimisation is done as part of a brand strategy, it may stretch into Paradigm 2. However, a Paradigm 4 approach would require a radical rethink, using cradle to cradle principles to create products with zero or even a positive impact on the environment (De Pauw, Karana, & Kandachar, 2013). Figure 1, with its succession of paradigms, may suggest that later paradigms replace earlier ones. Yet many of the tools, methods and techniques from earlier paradigms do not lose their value as design innovation enters a new paradigm. It may not even be possible to enter a new paradigm without fulfilling the requirements from an older paradigm. For example, in durable consumer goods it is difficult to build a trusted brand—a typical experience economy objective—without having a quality product according to the measures of the industrial economy. Likewise, in the transformation economy when a consortium is looking for a new partner, a trusted brand is likely to stand a better chance. Later paradigms thus build upon, rather than replace, earlier ones. As design innovation matures, for example, it grows bigger and more complex, and it is assumed that companies understand the thinking and have the required methods and tools to successfully handle the more established aspects of the product development process. In creating platforms for consumers to share information and experiences of a brand’s products and services, companies can create ongoing engagement with its users. It is then not only the qualities of the products and services themselves, but also the knowledge that users find on the web pertaining to those products and services that make the total proposition more enticing. Products that are supported by a strong online community typically allow issues and opportunities to be identified earlier than products that are backed only by the manufacturer. An additional benefit of community support is that it becomes much easier for users to find effective solutions and work-arounds because they have been verified by other users in situations similar to their own. With each paradigm, the notion of user-centredness changes. In Paradigm 1, companies had a reductionist view of users: anthropometrics reduced users to mechanical machines that a product needed to fit; cognitive ergonomics modelled users as computational engines reacting predictably to user interfaces. In Paradigm 2, companies reduced people to consumers. Consumers, in turn, were simplified to personas representing particular market segments. Brands could then be optimised to appeal to these segments and products tested through representative consumer confrontation tests. In Paradigm 3, companies collaborate with users through methods such as participatory design and build upon user-generated knowledge. Companies that choose not to provide a means for users to share solutions and opportunities fall behind. In addition, companies look for a scientific underpinning of human behaviour through psychological and physiological models. In Paradigm 4, design starts to address societal needs. Living labs allow in-context experimentation and data collection. Alignment with key opinion leaders from government, NGOs and use communities increases the chances of success. With each paradigm, people research evolves towards a fuller understanding of what it means to be human, and we view it as fundamental to good design (Kyffin & Gardien, 2009). In this paper, we paint with large brushstrokes more than a century of design innovation against a background of sociocultural and technological change, and categorize the shifts into four paradigms. In each paradigm, we described the consequences for design competences, design processes, design tools and design techniques. Rarely is it possible to find industry examples that follow all aspects of a paradigm. However, we think the patterns are unmistakable. In sync with sociocultural and technological change, companies need to find new ways of extracting value from the marketplace. Yet few companies manage to keep up with these paradigm changes. New paradigm territory is usually charted by start-ups rather than by established players; as a result, companies that grew up in an earlier paradigm risk being bogged down by an outdated mindset and ways of working. As Maslow (1966) puts it: “It is tempting, if the only tool you have is a hammer, to treat everything as if it were a nail” (pp. 15-16). Almirall, E., & Wareham, J. (2008). Living labs and open innovation: Roles and applicability. The Electronic Journal for Virtual Organizations & Networks, 10(3), 21-46. Anderson, R. C., & White, R. A. (2011). Business lessons from a radical industrialist. New York, NY: Random House LLC. Archer, L. B. (1965). Systematic method for designers. London, UK: Council of Industrial Design. Barber, B. R. (2007). Consumed: How markets corrupt children, infantilize adults, and swallow citizens whole. New York, NY: W. W. Norton. Barthes, R. G. (1972). Mythologies. New York, NY: Hill and Wang. Bense, M. (1967). Semiotik. Allgemeine theorie der zeichen. Baden-Baden, Germany: Agis -Verlag. Boer, L., & Donovan, J. (2012). Prototypes for participatory innovation. In Proceedings of the Conference on Designing Interactive Systems (pp. 388-397). New York, NY: ACM. Bouwstra, S., Chen, W., Feijs, L., & Oetomo, S. B. (2009). Smart jacket design for neonatal monitoring with wearable sensors. In Proceedings of the 6th International Workshop on Wearable and Implantable Body Sensor Networks (pp. 162-167). Piscataway, NJ: IEEE. Bouwstra, S., Chen, W., Feijs, L. M. G., & Oetomo, S. B. (2012). A theoretical framework for parent-to-infant bonding design at the NICU. In Proceedings of the 25th annual Gravens Conference on the Physical and Developmental Environment of the High Risk Infant (pp. 7-13). Clearwater Beach. Braungart, M., & McDonough, W. (2002). Cradle to cradle: Remaking the way we make things. New York, NY: North Point Press. Burns, C., Dishman, E., Verplank, W., & Lassiter, B. (1994). Actors, hairdos & videotape—Informance design. In C. Plaisant (Ed. ), Proceedings of the Conference Companion on Human Factors in Computing Systems (pp. 119-120). New York, NY: ACM. Buxton, W. (2007). Sketching user experiences: Getting the design right and the right design. San Francisco, CA: Morgan Kaufmann. Chen, W., Oetomo, S. B., & Feijs, L. (2012). Neonatal monitoring technologies, design for integrated solutions. Hershey, PA: IGI Global. Chomsky, N. (2012). Occupy (Occupied media pamphlet series).Westfield, NJ: Zuccotti Park Press. Den Ouden, E. (2012). Innovation design: Creating value for people, organizations and society. London, UK: Springer. Dewey, J. (1933). How we think. A restatement of the relation of reflective thinking to the educative process (Revised ed.). Boston, MA: D. C. Heath. Drucker, P. F. (1981). Toward the next economics and other essays. New York, NY: Harper & Row. Forty, A. (1986). Objects of desire: Design and society 1750-1980. London, UK: Thames and Hudson. Frens, J. W., Djajadiningrat, J. P., & Overbeeke, C. J. (2003). Form, interaction and function, an exploratorium for interactive products. In Proceedings of the 6th Asian Design Interactional Conference (CD-Rom). Tsukuba, Japan: Asian Society for the Science of Design. Fry, B. (2008). Visualizing data: Exploring and explaining data with the processing environment. Cambridge, MA: O’Reilly Media. De Geus, M. (1989). Organisatietheorie in de politieke filosofie. Delft, the Netherlands: Eburon. Gros, J. (1973). Erweiterter funktionalismus und empirische ästhetik [Elaborated functionalism and empirical aesthetics] (Diploma thesis). Braunschweig, Germany: Staatlichen Hochschule für Bildende Künste Braunschweig, Department of Experimental Environment Design. Horn, R. (1985). Memphis: Objects, furniture and patterns. Philadelphia, Pennsylvania: Running Press. Hummels, C. (2000). Gestural design tools: Prototypes, experiments and scenarios (Doctoral dissertation). Delft, the Netherlands: Delft University of Technology. Hummels, C. (2011). Teaching attitudes, skills, approaches, structures and tools. In B. Van Abel, L. Evers, R. Klaassen, & P. Troxler (Eds. ), Open design now; Why design cannot remain exclusive (pp. 162-167). Amsterdam, The Netherlands: BIS publishers. Hummels, G. J. A. (1996). Vluchtige arbeid: Ethiek en een proces van organisatie- ontwikkeling [Ephemeral labor: ethics and a process of organisational development] (Unpublished doctoral dissertation). Enschede, the Nederland: Universiteit Twente, Faculteit der Wijsbegeerte en Maatschappijwetenschappen. Kint, J., Ross, P., & Overbeeke, K. (2010). D’où venons nous? Que sommes nous? Où allons nous? [Where do we come from? What are we? Where are we going?] In Proceedings of the International Conference on Kansei Engineering and Emotion Research (pp. 332-340). Paris, France: Arts et Métiers Paris Tech. Klein, N. (1999). No logo, taking aim at the brand bullies. New York, NY: Picador. Knoester, J., Ross, P., & Djajadiningrat, T. (2012). Fluenci: The expression of expressing. In L. L. Chen, T. Djajadiningrat, L. Feijs, S. Fraser, S. Kyffin, & D. Steffen (Eds. ), Proceedings of the 7th International Workshop on the Design and Semantics of form and Movement (pp. 46-51). Wellington, New Zealand: School of Design, Victoria University. Krippendorff, K., & Butter, R. (1993). Where meanings escape functions. Design Management Journal, 4(2), 30-37. Kuhn, T. S. (1964). The structure of scientific revolutions. The Philosophical Review, 73(3) 383-394. Kyffin, S., Feijs, L., & Djajadiningrat, T. (2005). Exploring expression of form, action and interaction. Home-oriented informatics and telematics. IFIP International Federation for Information Processing, 178, 171-192. Kyffin, S., & Gardien, P. (2009). Navigating the innovation matrix: An approach to design-led innovation. International Journal of Design, 3(1), 57-69. Littlefield, D. (2008). Space craft: Developments in architectural computing. London, UK: RIBA Publishing. Maeda, J. (2001). Design by numbers. Cambridge, MA: MIT Press. Manovich, L. (2007). Abstraction and complexity. In O. Grau (Ed. ), Media art histories (pp. 339-354). Cambridge, MA: MIT Press. Maslow, A. H. (1966). The psychology of science: A reconaissance. New York, NY: Harper and Row. Olins, W. (2008). The brand handbook. London, UK: Thames & Hudson. De Pauw, I., Karana, E., & Kandachar, P. (2013). Cradle to cradle in product development: A case study of closed-loop design. In Proceedings of the 20th CIRP International Conference on Life Cycle Engineering: Re-engineering Manufacturing for Sustainability (pp. 47-52). Singapore: Springer. Peeters, M. M. R., Megens, C. J. P. G., IJsselsteijn, W. A., Hummels, C. C. M. & Brombacher, A. C. (2013). Experiential design landscapes: Design research in the wild. In E. Brandt, P. Ehn, T. Johansson, T. D. Johansson, M. Hellström Reimer, T. Markussen, & A. Vallgårda (Eds. ), Proceedings of the Nordic Design Research Conference (pp. 422-425). Copenhagen-Malmö, Denmark: Nordes. Piaget, J. (1964). Development and learning. In R. E. Ripple & V. N. Rockcastle (Eds. ), Piaget rediscovered: A report on the conference of cognitive studies and curriculum development (pp. 7-20). Ithaca, NY: Cornell University. Pine, B. J., & Gilmore, J. H. (1999). The experience economy: Work is theater & every business a stage. Boston, MA: Harvard Business Press. Piqueras Landete, F. J., Chen, W., Bouwstra, S., Feijs, L., Bambang Oetomo, S. (2012). Context aware sensing for health monitoring, in EMBC 2012, San Diego, California, USA, 2012. Pólya, G. (1957). How to solve it: A new aspect of mathematical method. Garden City, NY: Doubleday. Raymond, E. S. (2001). The Cathedral & the Bazaar: Musings on linux and open source by an accidental revolutionary. Cambridge, MA: O’Reilly Media. De Rijk, T. (1998). Het elektrische huis: Vormgeving en acceptatie van electrische huishoudelijke apparaten in Nederland [The electric house: formgiving and acceptation electric household appliances in the Netherlands]. Rotterdam, The Netherlands: 010 Uitgeverij. Rittel, H. W. J., & Webber, M. M. (1973). Dilemmas in a general theory of planning. Policy Science, 4(2), 155-169. Rocchi, S., & Kulkarni, U. (2010). Chulha – Healthy, indoor cooking. In A. L. Chavan & G. V. Prabhu (Eds. ), Innovative solutions: What designers need to know for today’s emerging markets (pp. 100-103). Boca Raton, FL: CRC Press. Rocchi, S., & Kusume, Y. (2008). Empowering creativity: A design-led innovation experience based on value co-creation and user insights. In P. Kandachar & M. Halme (Eds. ), Sustainability challenges and solutions at the base of the pyramid. Business, technology and the poor. Sheffield, UK: Greenleaf Publishing. Sennett, R. (2008). The craftsman. London, UK: Penguin Books. Sparke, P. (1986). An introduction to design and culture in the 20th Century. London, UK: Allen & Unwin. Toffler, A. (1980). The third wave. New York, NY: Bantam books. Van Abel, B., Evers, L., Klaassen R., & Troxler P. (2011). Open design now: Why design cannot remain exclusive. Amsterdam, The Netherlands: Bis Publisher. Venturi, R. (1966). Complexity and contradiction in architecture. New York, NY: The Museum of Modern Art Press. Verganti, R. (2009). Design driven innovation: Changing the rules of competition by radically innovating what things mean. Boston, MA: Harvard Business School Press. Verganti, R. (2011). Designing breakthrough products. Harvard Business Review, 89(10), 114-120. Versluis, A., & Uyttenbroek, E. (2002). Exactitudes: Arie Versluis and Ellie Uyttenbroek. Rotterdam, The Netherlands: 010 Uitgeverij. Vogel, W. V., Valde´s Olmos, R. A., Tijs, T. J. W., Gillies, M. F., Van Elswijk, G., & Vogt, J. (2012). Intervention to lower anxiety of 18F-FDG PET/CT patients by use of audiovisual imagery during the uptake phase before imaging. Journal of Nuclear Medicine Technology, 40(2), 92-98. Wolfe, T. (1981). From Bauhaus to our house. New York, NY: Macmillan. Wind, Y., & Cardozo, R. N. (1974). Industrial market segmentation. Industrial Marketing Management, 3, 153-166.